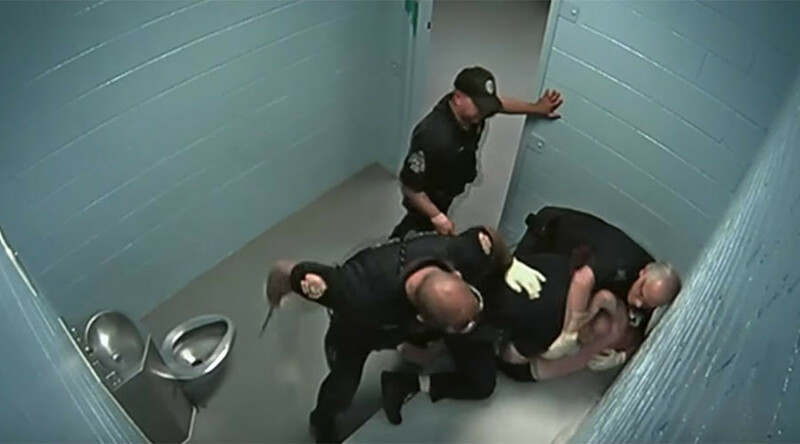 Video footage of the controversial incident that led to the firing of three Massachusetts officers has finally been released by Agawam police. Sergeant Anthony Grasso, Officer Edward Connor and Officer John Moccio were all fired last October following an investigation into the June incident that saw the three policemen use unnecessary force against a prisoner they had in custody. Connecticut man David Desjardins, 27, was arrested at the bar of a Six Flags amusement park after security called police because he became belligerent when a bartender cut him off, according to the police report. The officers claim Desjardins was combative and aggressive and had to be pepper-sprayed several times, insisting any force they used was appropriate. However, Police Chief Eric Gillis says the video evidence shows the officers used excessive force and violated several department policies. "When I saw the video, I was shocked by it. I knew that it was very serious and as the investigation proceeded it became more and more clear to me how serious it really was," Gillis told The Republican. Desjardins was charged with disorderly conduct and resisting arrest in addition to three counts of assault and battery on a police officer, and Police Chief Gillis controversially opened an investigation into Grasso, Connor and Moccio. All three were placed on paid administrative leave while the investigation was ongoing, and last October, Mayor Richard Cohen informed the men their employment would be terminated – a decision all three men plan to appeal. “My heart goes out to officers, it’s great injustice and poor leadership on behalf of the Chief and Mayor to terminate three officers who followed the policies and procedures of departments,” said the attorney for the officers, John Connor, to 22News. “When we do get their jobs back, I hope the Chief and Mayor will be held accountable,” Connor added. The case was handed over to the District Attorney’s office to decide if the men should face criminal charges, however District Attorney Anthony Gulluni confirmed on Friday that the men would not face further prosecution.